The Occupational Health and Safety Act (OHS Act) states that racking systems must be inspected and maintained regularly. EJP Consulting staff has years of experience with racking systems and storage systems and are available to inspect your company's system in order to alert you of any potential hazards which can result in injury, fines and possibly prosecution. By having our staff conduct an inspection, you demonstrate your company's due diligence. Our staff are all well versed with the OHS Act and are familiar with the standards and responsibilities associated with racking systems which ensures a thorough, concise, and detailed report that will be discussed with your company's Joint Health and Safety Committee. 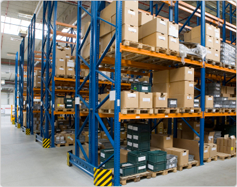 This will identify any hazards and potential risks so that the JHSC is aware of all issues so that they can take necessary steps to correct them.Incorporating regular scheduled inspections and maintenance in your company's Racking Storage Systemwill ensure due diligence and the safety of your staff at all times.